I first made this recipe for Christmas, and it proved such a big hit among the men in our family that I thought it would be a natural for Valentine’s Day. 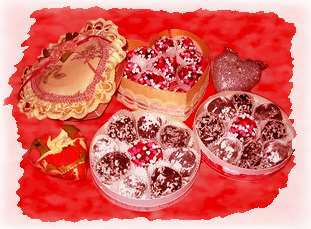 If you don’t have heart shaped sprinkles, you could roll the truffles in red sugar sprinkles, coconut or ground walnuts, then nestle each truffle in plain or Valentine theme paper candy cups. 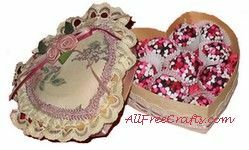 Present the truffles to your Valentine in a padded heart shaped box or a small heart-shaped tin. Use a food processor or blender to reduce enough Oreo cookies to make three cups of fine crumbs. Set aside. Melt chocolate in a double boiler OR empty chocolate chips into a large microwaveable mixing bowl and microwave on high, stirring at 45 second increments, until the chips are melted. It shouldn’t take more than two or three minutes – but watch carefully, as chocolate goes from melted to burnt very quickly in the microwave. Add softened cream cheese and mix thoroughly with chocolate, until all white streaks are gone. Add three cups of the Oreo crumbs. The mixture will be stiff, but continue stirring until it is thoroughly combined and fairly smooth. Form dough into small balls and roll in the sprinkles to coat. Place each Oreo truffle into a paper candy cup. Store in the fridge and serve slightly chilled for the best texture and taste.